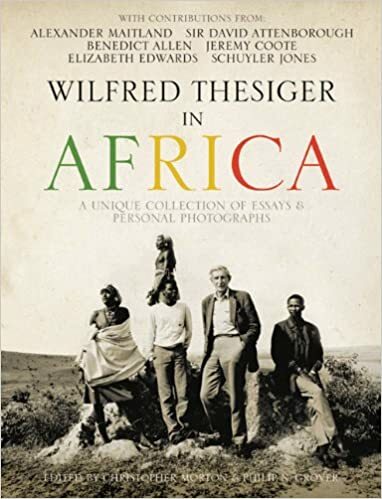 Along with Sir Wilfred Thesiger's beautiful photographs—most of them previously unpublished—the essays in this volume explore and evaluate his lifetime of African exploration and travel, as well as, for the first time, his photographic practice and its legacy as a museum collection. Wilfred Thesiger was, in the words of David Attenborough, "one of the very few people who in our time could be put on the pedestal of the great explorers of the 18th and 19th centuries." Throughout his life he journeyed through some of the remotest, most dangerous areas of Africa, witnessing and photographing fast-changing cultures to great acclaim. During the 1960s he traveled extensively in East Africa, and from 1978 he spent the greater part of each year living among the pastoral Samburu in Kenya, until retiring to England in 1994. His books, including Arabian Sands and The Marsh Arabs, have been hailed as classics of modern travel writing. Here in this collection, Thesiger is featured in conversation with David Attenborough, while other contributors include Benedict Allen, Jeremy Coote, Elizabeth Edwards, and Schuyler Jones. Published to coincide with the centenary of Wilfred Thesiger's birth in Ethiopia in 1910, this book is a moving celebration of Thesiger's enduring relationship to the continent, and his fascination with its peoples and landscapes. (Emberiza striolata striolata).21 As well as skinning and preserving the animals and birds he shot, and interviewing the Afar, Thesiger carried out many other time-consuming and sometimes intricate tasks himself. While the expedition gave no template for the style of his later journeys, he admitted he had felt relieved when David Haig-Thomas–a companion whom Thesiger’s mother had insisted he must take with him–dropped out, because of illness, after a preliminary journey in the Arussi Mountains.